Will new Obama ocean policy affect offshore drilling? Today President Obama became the first American President to codify a U.S. position on Oceans through the establishment of an Executive Order. While the recommendations to the President by the Interagency Ocean Policy Task Force were just published in their final form today, indications of what would be in the policy document have been circulating since last fall, and while there are small changes in the final document, the Executive Order largely follows the draft recommendations from 2009. The “policy of the United States” for oceans does include some language that will potentially result in changes from the status-quo. The policy will “promote the well-being, prosperity, and security of present and future generations,” and depending on how this language is interpreted, decisions on resource utilization, which has too often been short-sighted, might finally take a long term view. The nine “essential elements” of the Obama Administration’s process to select optimal uses and reduce/avoid use conflicts may result in a good long run public policy process, but it is doubtful that they could move fast enough to address the Gulf of Mexico issue of deepwater drilling or the Shell request to drill in the Arctic. Those decisions are likely to be made by DOI in a more traditional manner. While there is a nod to the events in the Gulf of Mexico (“The Deepwater Horizon oil spill in the Gulf of Mexico and resulting environmental crisis is a stark reminder of how vulnerable our marine environments are, and how much communities and the Nation rely on healthy and resilient ocean and coastal ecosystems”) there is little that directly addresses the problems that the people of the Gulf of Mexico struggle with today….with one potential exception: coastal and marine spatial planning. But that process is intended to be a fairly through, methodical process with broad input from a range of federal, state and tribal stakeholders, in addition to input from affected parties and the public. These processes are designed to generate the greatest buy-in, but it is unlikely that they can move quickly enough at this point to address fast-moving policy issues that are on the Administration’s plate today, particularly the hot-button topic about whether to allow, or indefinitely block, new deepwater drilling in U.S. waters. But while it doesn’t provide a clear roadmap that indicates where we are headed as a nation which continues to struggle with conflicting uses and practices that have significant impacts on the environment and the economy, it does provide a framework for organization. How the organizing governance bodies, headed by the National Ocean Council (NOC), make decisions will have a large role on the function of these groups, and their importance to public policy development and oversight. The last Administration did not declare how decisions would be made within the Commission on Ocean Policy (COP) or in their subordinate organizing groups, and this limited their usefulness for some policy areas. This Administration’s decision that “The Co-Chairs would seek to encourage decisions and recommendations based on consensus of the [National Ocean Council]” with disputes being forwarded to the President may mean that those frustrated with a NEPA process where those with “comment authority” are ultimately ignored and a Coastal Zone Management Act “coastal consistency” which allows veto power to one entity – the state – would become more balanced. Or these sorts of conflicts may never reach the NOC, having been deemed to fall into the category of decisions constrained by existing statutory processes which determine comment and decision authority. It might take a move by Congress if the processes surrounding those processes will change. So while we have a National Ocean Policy for the first time, and we have a 96 page policy recommendation that will be the Bible that this Administration follows, how this exactly plays out – we’ll have to wait a bit longer to wait and see. Section 1. Purpose. The ocean, our coasts, and the Great Lakes provide jobs, food, energy resources, ecological services, recreation, and tourism opportunities, and play critical roles in our Nation’s transportation, economy, and trade, as well as the global mobility of our Armed Forces and the maintenance of international peace and security. The Deepwater Horizon oil spill in the Gulf of Mexico and resulting environmental crisis is a stark reminder of how vulnerable our marine environments are, and how much communities and the Nation rely on healthy and resilient ocean and coastal ecosystems. America’s stewardship of the ocean, our coasts, and the Great Lakes is intrinsically linked to environmental sustainability, human health and well-being, national prosperity, adaptation to climate and other environmental changes, social justice, international diplomacy, and national and homeland security. This order adopts the recommendations of the Interagency Ocean Policy Task Force, except where otherwise provided in this order, and directs executive agencies to implement those recommendations under the guidance of a National Ocean Council. Based on those recommendations, this order establishes a national policy to ensure the protection, maintenance, and restoration of the health of ocean, coastal, and Great Lakes ecosystems and resources, enhance the sustainability of ocean and coastal economies, preserve our maritime heritage, support sustainable uses and access, provide for adaptive management to enhance our understanding of and capacity to respond to climate change and ocean acidification, and coordinate with our national security and foreign policy interests. 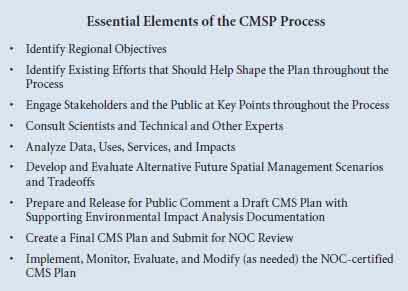 This order also provides for the development of coastal and marine spatial plans that build upon and improve existing Federal, State, tribal, local, and regional decisionmaking and planning processes. These regional plans will enable a more integrated, comprehensive, ecosystem-based, flexible, and proactive approach to planning and managing sustainable multiple uses across sectors and improve the conservation of the ocean, our coasts, and the Great Lakes. (x) foster a public understanding of the value of the ocean, our coasts, and the Great Lakes to build a foundation for improved stewardship. (iv) supporting ocean stewardship in a fiscally responsible manner. (a) “Final Recommendations” means the Final Recommendations of the Interagency Ocean Policy Task Force that shall be made publicly available and for which a notice of public availability shall be published in the Federal Register. (b) The term “coastal and marine spatial planning” means a comprehensive, adaptive, integrated, ecosystem-based, and transparent spatial planning process, based on sound science, for analyzing current and anticipated uses of ocean, coastal, and Great Lakes areas. Coastal and marine spatial planning identifies areas most suitable for various types or classes of activities in order to reduce conflicts among uses, reduce environmental impacts, facilitate compatible uses, and preserve critical ecosystem services to meet economic, environmental, security, and social objectives. In practical terms, coastal and marine spatial planning provides a public policy process for society to better determine how the ocean, our coasts, and Great Lakes are sustainably used and protected — now and for future generations. (c) The term “coastal and marine spatial plans” means the plans that are certified by the National Ocean Council as developed in accordance with the definition, goals, principles, and process described in the Final Recommendations. Sec. 4. Establishment of National Ocean Council. (a) There is hereby established the National Ocean Council (Council). (v) such other officers or employees of the Federal Government as the Co-Chairs of the Council may from time to time designate. (c) The Co-Chairs shall invite the participation of the Chairman of the Federal Energy Regulatory Commission, to the extent consistent with the Commission’s statutory authorities and legal obligations, and may invite the participation of such other independent agencies as the Council deems appropriate. (d) The Co-Chairs of the Council, in consultation with the National Security Advisor and the Assistant to the President for Homeland Security and Counterterrorism, shall regularly convene and preside at meetings of the Council, determine its agenda, direct its work, and, as appropriate to address particular subject matters, establish and direct committees of the Council that shall consist exclusively of members of the Council. (e) A member of the Council may designate, to perform committee functions of the member, any person who is within such member’s department, agency, or office and who is (i) an officer of the United States appointed by the President, (ii) a member of the Senior Executive Service or the Senior Intelligence Service, (iii) a general officer or flag officer, or (iv) an employee of the Vice President. (f) Consistent with applicable law and subject to the availability of appropriations, the Office of Science and Technology Policy and the Council on Environmental Quality shall provide the Council with funding, including through the National Science and Technology Council or the Office of Environmental Quality. The Council on Environmental Quality shall, to the extent permitted by law and subject to the availability of appropriations, provide administrative support necessary to implement this order. (g) The day-to-day operations of the Council shall be administered by a Director and a Deputy Director, who shall supervise a full-time staff to assist the Co-Chairs in their implementation of this order. Sec. 5. Functions of the Council. (a) The Council shall have the structure and function and operate as defined in the Final Recommendations. The Council is authorized, after the Council’s first year of operation, to make modifications to its structure, function, and operations to improve its effectiveness and efficiency in furthering the policy set forth in section 2 of this order. (b) To implement the policy set forth in section 2 of this order, the Council shall provide appropriate direction to ensure that executive departments’, agencies’, or offices’ decisions and actions affecting the ocean, our coasts, and the Great Lakes will be guided by the stewardship principles and national priority objectives set forth in the Final Recommendations, to the extent consistent with applicable law. The Council shall base its decisions on the consensus of its members. With respect to those matters in which consensus cannot be reached, the National Security Advisor shall coordinate with the Co-Chairs and, as appropriate, the Assistants to the President for Energy and Climate Change, and Economic Policy, and the employee of the United States designated by the Vice President, subject to the limitations set forth in section 9 of this order, to present the disputed issue or issues for decision by the President. (ii) participate in the process for coastal and marine spatial planning and comply with Council certified coastal and marine spatial plans, as described in the Final Recommendations and subsequent guidance from the Council. (b)Each executive department, agency, and office that is required to take actions under this order shall prepare and make publicly available an annual report including a concise description of actions taken by the agency in the previous calendar year to implement the order, a description of written comments by persons or organizations regarding the agency’s compliance with this order, and the agency’s response to such comments. (c) Each executive department, agency, and office that is required to take actions under this order shall coordinate and contribute resources, as appropriate, to assist in establishing a common information management system as defined in the Final Recommendations and shall be held accountable for managing its own information assets by keeping them current, easily accessible, and consistent with Federal standards. (d) To the extent permitted by law, executive departments, agencies, and offices shall provide the Council such information, support, and assistance as the Council, through the Co-Chairs, may request. Sec. 7. Governance Coordinating Committee. The Council shall establish a Governance Coordinating Committee that shall consist of 18 officials from State, tribal, and local governments in accordance with the Final Recommendations. The Committee may establish subcommittees chaired by representatives of the Governance Coordinating Committee. These subcommittees may include additional representatives from State, tribal, and local governments, as appropriate to provide for greater collaboration and diversity of views. Sec. 8. Regional Advisory Committees. The lead Federal department, agency, or office for each regional planning body established for the development of regional coastal and marine spatial plans, in consultation with their nonfederal co-lead agencies and membership of their regional planning body, shall establish such advisory committees under the Federal Advisory Committee Act, 5 U.S.C. App., as they deem necessary to provide information and to advise the regional planning body on the development of regional coastal and marine spatial plans to promote the policy established in section 2 of this order. (ii) functions assigned by the President to the National Security Council or Homeland Security Council (including subordinate bodies) relating to matters affecting foreign affairs, national security, homeland security, or intelligence. (b) Nothing in this order shall be construed to impair or otherwise affect the functions of the Director of the Office of Management and Budget relating to budgetary, administrative, or legislative proposals. (c) In carrying out the provisions of this order and implementing the Final Recommendations, all actions of the Council and the executive departments, agencies, and offices that constitute it shall be consistent with applicable international law, including customary international law, such as that reflected in the Law of the Sea Convention. Sec. 10. Revocation. Executive Order 13366 of December 17, 2004, is hereby revoked. THE WHITE HOUSE, July 19, 2010.